Game Of Thrones showrunners David Benioff and Dan Weiss made a lot of savvy choices when they began adapting George R. R. Martin’s epic fantasy series to the screen, but it’s becoming increasingly clear that hiring composer Ramin Djawadi to write the show’s main theme was one of their best. Djawadi’s song has caught the public imagination, inspiring multitudes of Internet artists to re-interpret it in a variety of genres, including heavy metal ballet, smooth jazz, and of course Peter Dinklage. Now, Benedikt Mendzigal and Daniel Brauner of YouTube channel BenDanProductions have added another surprisingly fitting twist to the song by translating it into the style of a classic Western score. 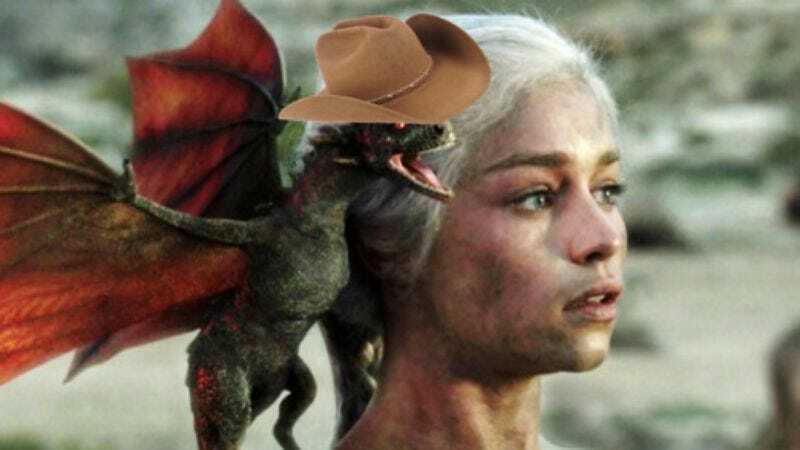 The Morricone-esque whistles and timpani of their cover manage to evoke a fascinating alternate take on the setting, where dragons soar over the sun-parched plains, gun-toting desperados ravage the helpless countryside, and the solemn marshals of the Night Watch protect the northern border from attacks. Call it Once Upon A Time In The Westeros, if you will. Of course, the video itself, which features Mendzigal standing alone in a field, dressed like Howdy Doody and pretending to play an unplugged electric guitar, doesn’t quite have the series’ epic scope. Pretty song, though.